Roulette... It's been around for quite a long time. Over two hundred years ago it appeared in life on France and since then the whole world accepted it. It is only a simple game with the wheel which rotates, guy who spins the wheel and other curious folks who stare at the wheel. It's about gambling spirit, lucky guess and everything that goes with it. Most online casinos offer the same experience, so nowadays it doesn't really matter whether to play online or at real casino - you'll have fun in any case! Also take a look at 2 ways royal game. So, the roulette rules! Why should we know them? Well, first of all, not to look strange among the players in the casino and not to be a black sheep that doesn't even have a guess about what is happening. Second of all, to be certain in what you do, because you become more confident when you know what you can expect and what should be done by you. Behave nice. We talk about this point more in the following passages, but you should always remember that. It's a bit strange that the story of the roulette invention is lost in mystery, as the historians cannot decide on any version to be valid enough to be called the main version. Let's suppose that it was invented by Blaise Pascal, it is a nice variant, besides it is rather popular and more possible than the though that roulette was introduced by Devil. Actually, if to believe the version that Pascal created it, the roulette was invented accidentally, it was a failed experiment. But people were more than glad to receive something from the scholar-guru. Only the players can sit at the table. Even if there is only one player, the dealer will ask you to move if you do not play. You need to buy the chips for playing at the roulette table. If you are passing by, you can place a single bet with your other chips or cash. But if you decide to stay you have to buy more as roulette is not a game of one bet. You may not think about all those details when you play online. Have a wild time with the Wild Jack Mobile Casino. You'll enjoy everything from blackjack and slots to real mobile roulette and you can do that anytime you want to enjoy the games - anywhere that you have a mobile device available to play. You should know minimum and maximum inside and outside bets of the house so that you'll be able to work out your own strategy. The dealer announces when you can bet. If you want to place the bet at the number you cannot reach, you should ask the dealer to do that for you. You can continue betting even when the wheel is spun and the ball is thrown. When the ball is about to fall down on the row with the numbers, the dealer will say "No more bets". You must obey, because if you don't, it will be called pastposting or cheating, which would be the worst thing happening to you that day as that is a stong violation of casino rules. When the ball lands into the pocket, the dealer will place dolly (special marker) on the winning number. If your bet is lost, the dealer will sweep it away. Do not touch your lost bet, as it can also be taken for cheating. We know that ignorance of law doesn't release from responsibility. If your bet wins, you receive the payoff but the dealer doesn't touch the winning bets on the table. It means, either you take them away by yourself or leave for the next spin. Before you leave the table, you should exchange the table chips for general casino chips, because as soon as you leave the table the chips lose their value and you won't be able to exchange them later. 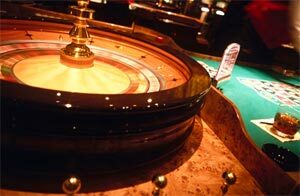 The roulette game is also called "The Devil's Game", as the sum of all the numbers on the table gives 666. The most known bet is number 17. You ask why? Because James Bond betted on this number in the movies. The numbers are placed in "strange" order on the wheel. It was done so, because it makes the game as fair as possible.